Dublin – 28 September, 2018 – 100 Women in Finance (100WF), a global non-profit organisation that supports more than 15,000 professionals in the finance and alternative investment industries, yesterday celebrated the launch of its NextGen Dublin group with HRH The Countess of Wessex GCVO, Global Ambassador for 100 Women in Finance’s Next Generation initiative. This is the ninth NextGen group, which is designed for women with up to ten years’ experience in the financial services industry. 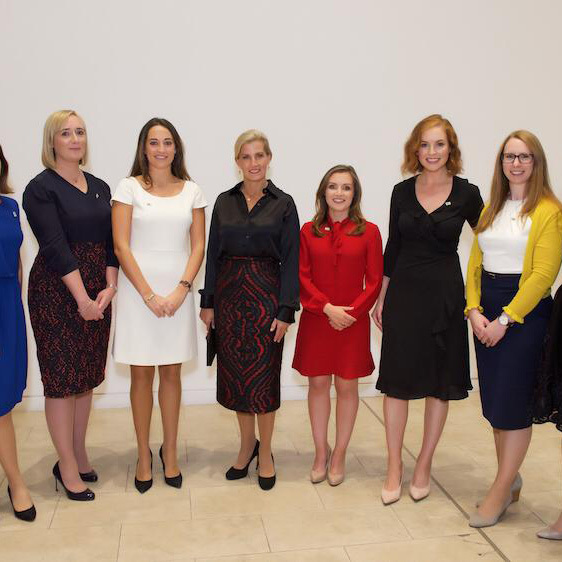 The Countess, 100WF members and guests from the financial services and related industries attended the launch event at the Royal Hibernian Academy with keynote speaker, Fiona Gallagher, Global Head of Securities Services and Chief Country Officer of Deutsche Bank. The event was attended by more than 150 people from the financial services industry in Dublin. Earlier today, The Countess opened and participated in a round table breakfast organized by 100WF’s NextGen Dublin committee at Trinity College Dublin for female undergraduate students considering a career in financial services. The round table discussions were facilitated by women in the early years of their careers in the financial services industry. “100 Women in Finance has a more than 15-year history of successfully empowering professional women globally across the alternative investment and finance industry through education, access to peer networks and opportunities to support non-profit groups. We also recognize the importance of promoting the next generation of female leaders in the industry. The launch of the NextGen group in Dublin is part of our global commitment to encourage more young women to enter our industry. Also, we ensure we provide vital support at an early stage in their careers, so they can better face the challenges and maximize opportunities in the finance industry,” said Amanda Pullinger, Chief Executive Officer of 100 Women in Finance. “HRH The Countess of Wessex is a strong advocate for professional women globally. Through Her Royal Highness’s visit to our Dublin location, we raise the visibility of the work 100WF is doing locally and globally to empower women in our industry and open doors for them. 100WF’s achievements are made possible by our committees of dedicated volunteers and our industry sponsors,” Pullinger added. ”As we welcome our financial services colleagues with up to ten years’ financial services industry experience into 100 Women in Finance NextGen, we highlight some of the valuable opportunities they will enjoy: timely discussions with leading market participants, sessions on career development, and skill enhancement, including through participation on committees. We are grateful to the NextGen Dublin Committee, under co-chairs Aoife Medlar of PWC and Hannah Cooney of William Fry and with guidance from Lorena Dunne of William Fry and a member of 100WF’s Dublin Main Committee, for all their efforts to bring about NextGen Dublin. 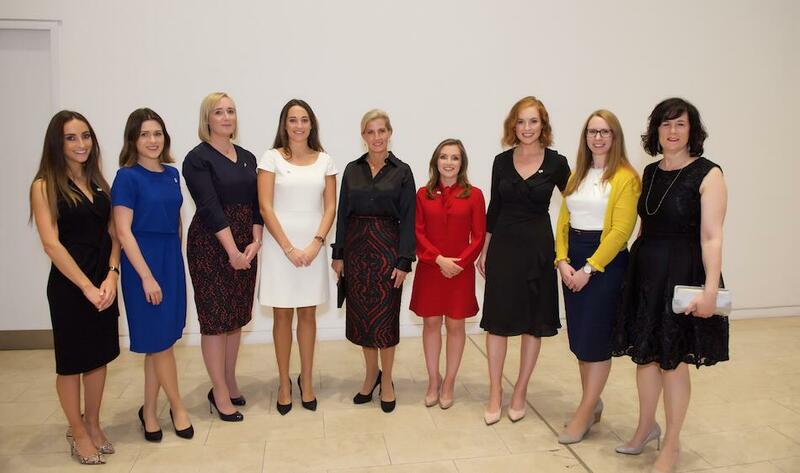 We look forward to NextGen Dublin developing into a thriving peer-network with programming to meet the needs of its NextGen members,” said Carol Widger, Chair of 100 Women in Finance Dublin Main Committee. “Thanks also to William Fry, Citco, PwC, Microsoft Ireland, KKR, KBI Global Investors, Dillon Eustace, The Panel, Royal Hibernian Academy and Trinity College Dublin for their support in delivering these events launching the NextGen group in Dublin,” added Widger. 100WF’s NextGen groups focus on female 100WF members working in the financial services industry and who have up to ten years of professional experience. The groups, led by volunteer committees who are themselves members of the NextGen group provide an educational and social forum at which members can build lasting, synergistic relationships. Each year, the groups host educational speaker events and more intimate gatherings with a view to developing a community of strong, young women who will ultimately guide each other through the progression of their careers. To foster a communal atmosphere, events hosted by NextGen Groups are only open to 100WF members who meet the NextGen group’s membership criteria and have joined a NextGen group. There are currently NextGen groups in the Cayman Islands, North California, South California, Hong Kong, London, New York, Singapore, Dublin and Toronto. The first 100WF event in Dublin took place in May 2017; following the successful establishment of 100WF in Dublin, a 100WF NextGen group has now being launched there.